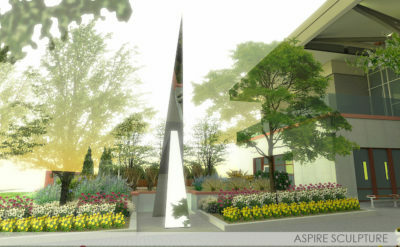 I am thrilled to share – ASPIRE – my new sculpture design I created for the Denver Botanic Gardens. I am still waiting to see if I was selected as the finalist, but feel nonetheless honored to go up against an elite group of talented artists. My design supports the botanical garden’s philosophy on the interaction between humankind and nature. It is composed of 2 slender mirror polished, interconnected stainless steel spires. 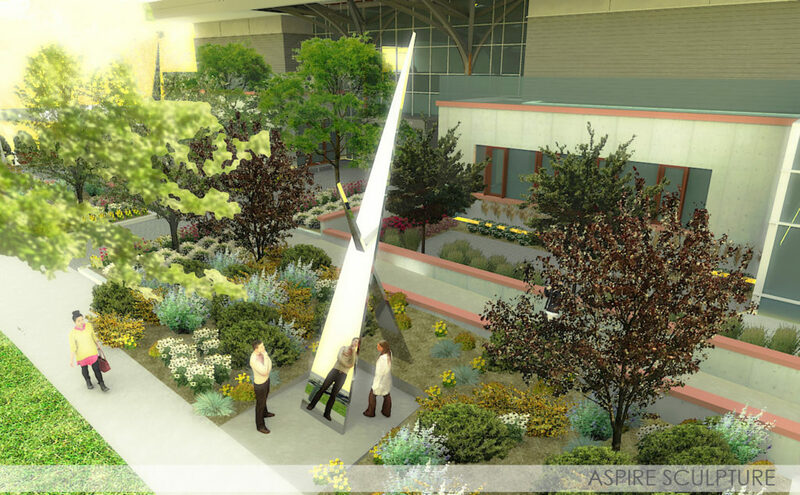 My sculpture excites the environment of the space it occupies, reflecting the world around it. 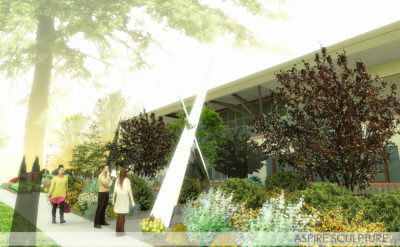 I like to defy reality by under constructing as much as possible which gives my piece an ethereal feel. 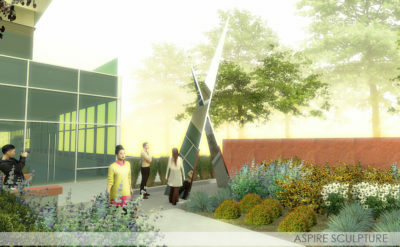 It shape shifts the surrounding space and bears witness to the fact that humans can overcome obstacles by looking outside conventional solutions. In the sculpture, Aspire, the gravity defying reflective angles transport the viewer to soar to greater heights of self-realization while relying on nature. The microcosm supports the macrocosm, creating a symbiosis between the natural world and mankind, inextricably interlinked and reliant on each other. The geometric angles in each piece establish that you are never quite sure what you are looking at. Sunshine, clouds, rain, snow and moonlight are constantly transforming my sculpture, creating unique experiences for each viewer, each second of every day. My use of pure geometry is a belief that perfection does exist, as does the absolute, however ephemeral that may be. 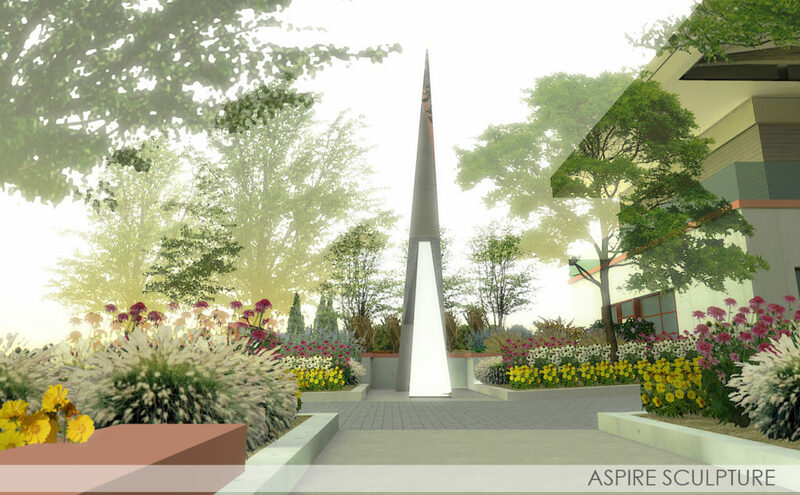 The Spire shape has been used since time immemorial to represent the best in humanity. 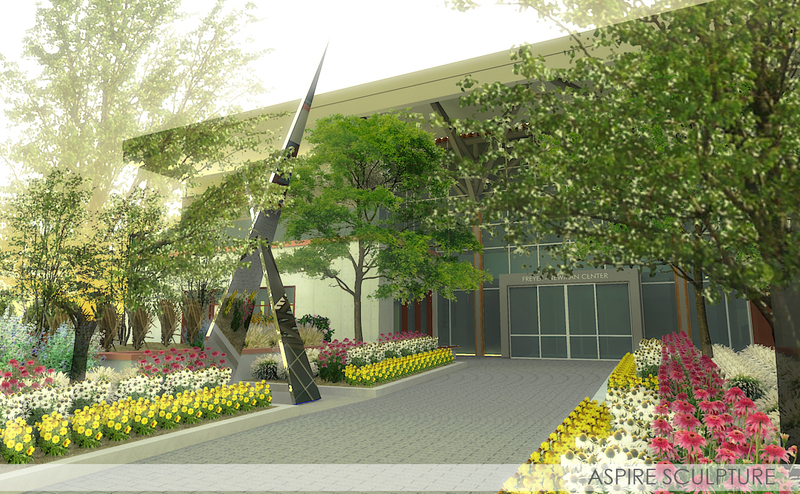 It portrays the striving of the spirit and is epitomized in pyramids, cathedrals and monuments, and in nature by the majesty of mountain peaks and soaring trees. 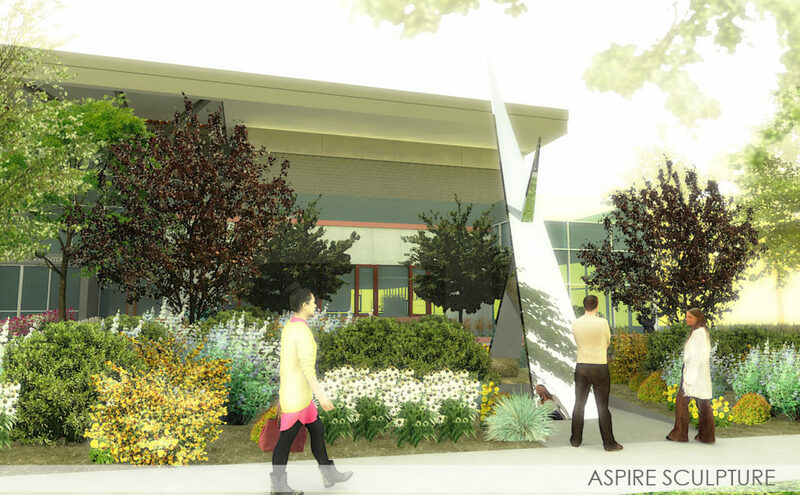 Aspire inspires man and nature to work together as a mutual support system in order to find solutions to the dangers that face our natural world. The importance of the interaction between humans and the natural world cannot be overstated. On one hand, humans are uplifted by their time spent in nature, but on the other hand, mankind can also destroy nature. 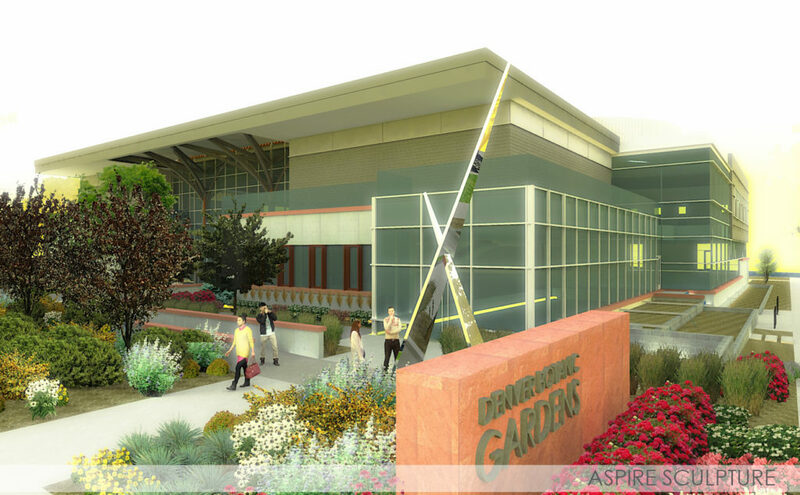 DBG is making it clear that the preservation of the natural world is of the utmost importance and brings this message home to the Denver community. 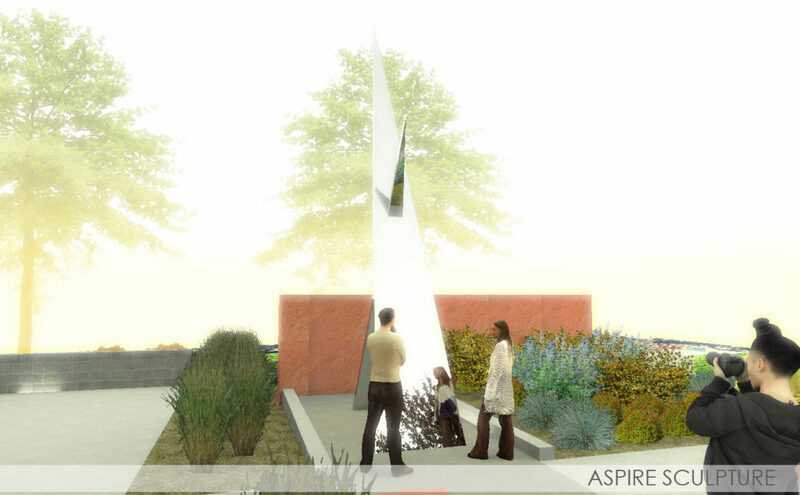 Aspire’s reflective surface conspires with the humans and nature around it. 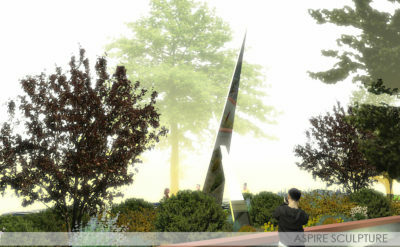 The surroundings actually become embedded into the sculpture and reflected back to the viewer. The message Aspire sends to the world will still be valid in 300 years. I would also like to think that the coexistence of humans and nature will still be in play 300 years from now, through the best endeavors of humans to preserve our majestic planet. 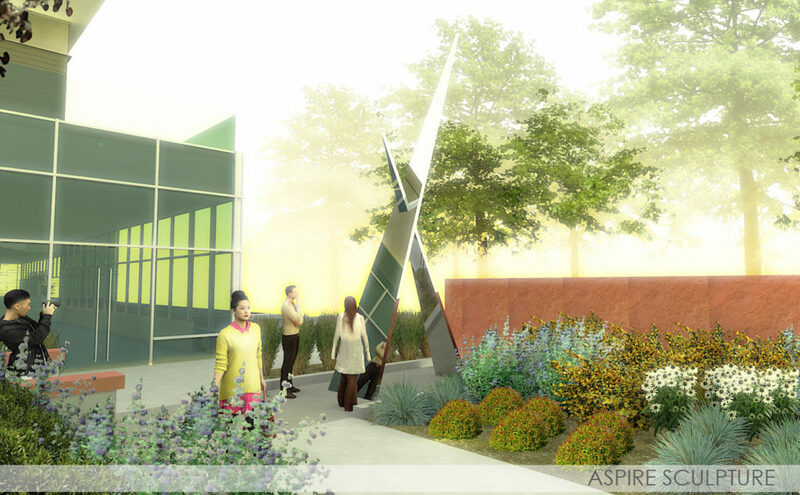 Renderings graciously provided by Local Denver fabricator – Silo Workshop.